One advantage to having a small dog is that you have more choices when it comes to pet carriers. When you want to take your dog or puppy with you on small outings, a pet purse would be a great way to take them along, without having to carry a bulky carrier. 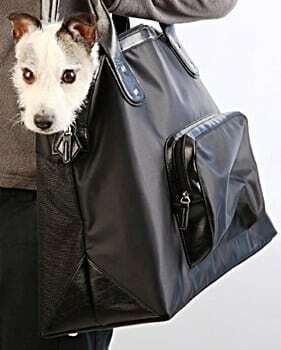 If you watch tv or movies, you have undoubtedly seen people carrying their small dogs in pet purse carriers. The smaller the dog, of course, you will have more choices. There are even boutiques that sell only dog purse carriers. There are some real advantages of carrying your small dog, or even puppy, in a purse. Some stores refuse to let pets in. If you have a quiet dog, you can easily take them in with you, because no one will be able to tell you to have one. The interest in pet purse carriers is gaining popularity quickly, but there are a few things that you should consider when choosing one. 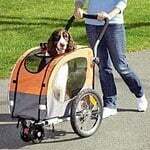 Although you want something stylish, you also want to keep your pet from jumping out and getting hurt. Below we will talk about different types of carriers that look like very much like purses. You will be able to take your best friend along with you almost everywhere. You can either show them off, or you can take them with you discreetly. A dog is considered small when he or she weighs less than 20 pounds. While they can be easily carried in your arms, if you want to take them with you on outings, you have to have them in some carrier. If you have a bulky one, this can make things a bit difficult. But when you have a pet purse carrier, it is a lot easier. While you can’t use a regular purse for your pet, they do sell specially designed pet purses. They can only hold small dogs, and they are specifically made to be used as such. There are a few very good ones and can keep your pet hidden if you choose, or they can be opened to allow your pet to see out when you are walking around. One of these is the Sherpa tote around pet carrier. Sherpa is a well-known brand for its stylish totes and carriers, and this one looks very much like a purse. If you click on the link, you will be able not only to see what it looks like, but you will also be able to find out more about it. You can also check out reviews from past customers, which is highly recommended. It is made of very sturdy materials, and there are three sides of mesh to allow air flow. They are not only for vet visits or short trips. As long as your dog is quiet, you can easily take them into stores with you when you have to run in and get a few things. Sherpa gives you different choices of style, and you won’t look like you’re carrying your dog with you unless you want to. Many people have gotten compliments on these, and their dogs love the extra attention they receive. 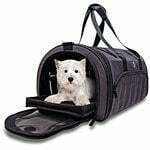 Another recommended purse like dog carrier is the Argo by Teafco pet carrier. It is very stylish and is pink in color. It is even more like a purse, as it has zippered pockets on the outside where you can keep your wallet, phone, etc. without worrying about them falling out. You can also easily keep extra things for your pet in them, especially treats or doggie bags. You can read our review by clicking the above link or find out what previous customers have to say in their reviews. If you want to go in style, a purse carrier is a good option. They not only keep your pet safe, but you don’t have to lug a hard carrier with you. For many people, a purse is much more comfortable and looks nice. Some people find that other totes or carriers look terrible and just don’t fit into their lifestyle. 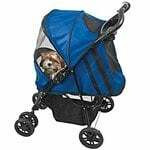 When you want a great looking way to take your small dog with you, these two designer purse-like carriers would be great choices for you. Even though you want to look good, you do have to make sure that your dog is safe, and won’t jump out. The above purse totes keep your dog safe and secure, along with keeping them and yourself comfortable. No more leaving them at home because you don’t have a nice way of taking them with you. You can both be happy when you go out. This is one of the best things about pet purses for small dogs. You will be able to keep the fashionable look and style that you want. You can easily take them with you while walking, or by car to get to your destination safely. They are also airline approved, so you can even use them if you are traveling via airplane. It is nice to be able to go out to lunch with a friend and also take your dog. 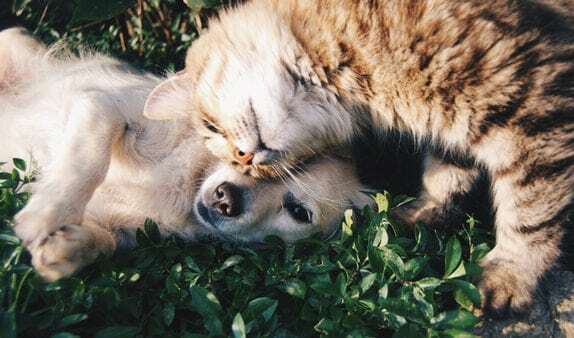 They will enjoy being with you and seeing more than just their home. They will also love the extra attention that they get from people. While you may see people putting their dogs in tiny purses, they are usually on TV. It has become a trend in some places, but these dogs are very small. They are called teacup dogs and can fit into much smaller purse totes. They usually only weigh about 5, maybe 10 pounds at the most. Whatever style of purse you choose for your small dog, you can be assured that they will be safe and comfortable. They will also be inconspicuous unless you want them to be seen. While there may be more styles that come out, make sure that there is enough airflow in them, and that there is a slip inside that will ensure that your dog won’t be able to jump or even fall out. Most dog purses will have these, but just be sure. You will love going on outings when you can easily take your small dog with you in a purse style tote. You will be able to run errands, visit friends, and pretty much whatever else you want to do. All the while your purse holds not only your pet but also everything that would go into a regular purse.